It was the Holt Tide Ride at Hayling Island a week or so ago, and it was a great event. 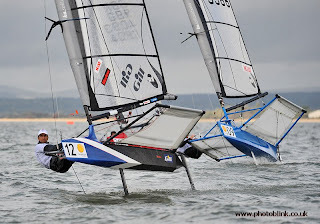 Although the wind made it feel like we were back at the Worlds for most of the time. With racing for the Moths scheduled for 4pm, a few of us decided to go for a sail in the morning as the forecast didn't look so good for the rest of the day with 50knots forecast overnight. Simon, Mike Lennon, Jason and myself all went for a quick blast around. 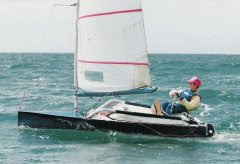 It was a bit daunting sailing around inside Hayling at pace with little confidence of where the shallows were. I got a shock when I looked down at my GPS to see it reading 28/29! but then I remembered I'd changed the units to go for a bike ride a few days before. Sunday dawned with planty of breeze, but all the fleets stuck around for a bit more tea drinking until in moderated. We got out around midday for 4 very short tight races. Typical race length was 12/15 mins, and with 4 laps in that it was a question of good clean lanes and boathandling. 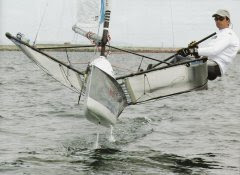 Overall, Simon was on good form, winning the first three races, and coming 2nd in the 4th, to win the no discard series. His boathandling was very good, and he was happy in the Hayling tide that caught many people out. Jason Belben was second overall with top three finishes. I was 4th with a 4,2,2,4. Poor start in the first, then got it together for the next two, and then a poor lane in the left corner in the last one left me with too much to do during the race. Everyone enjoyed the short course racing, although there were lots of tired looking people later.. (Especially Rod, although the evening drinking probably was the cause....) The fleet is keen for more racing so I think we should have a good turnout in Wales in a few weekends time. Development wise it was great to see such a huge variety of wands on display at the front of the fleet. Simon had his latest paddle version in high lift mode, while Mike Lennon had a fancy adjustable length paddled one, although it swung fwd so far when all the way up that we'll have to be careful soon on our 500mm bow fittings allowance.... Another thing to mention in the measurement manual I'm trying to update. 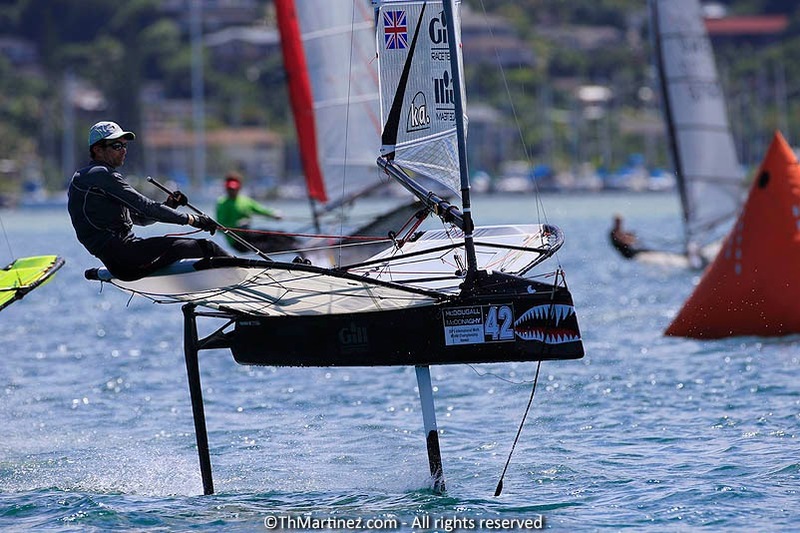 Photo from http://www.photoblink.com/sailing/tideride08/ where there are several more good shots from the weekend. I finally got round to painting my boat, after I'd left it with just one coat of lacque for the light wind Weymouth Worlds! So I've tried a metallic blue, white & carbon combo.